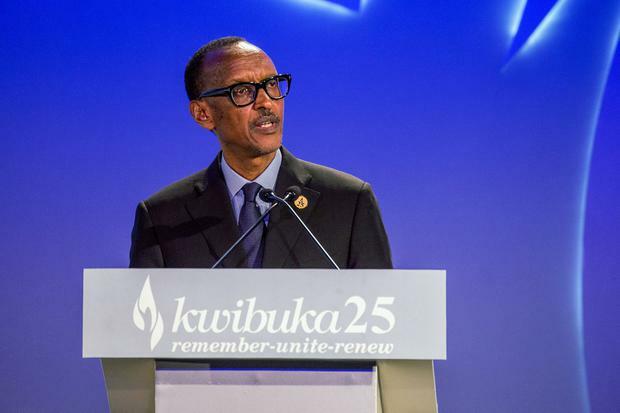 Rwandan President Paul Kagame delivers a speech marking the 25th anniversary of the 1994 Rwanda genocide at the Kigali Genocide Memorial in Kigali, April 7, 2019. REUTERS/Jean Bizimana. Twenty-five years after the start of its genocide, in which some 800,000 people were killed, Rwanda is rebuilding with hope and shines with a new light, said its President Paul Kagame. Speaking at commemoration services on Sunday, Mr Kagame said that Rwandans would never turn against each other again. "Our bodies and minds bear amputations and scars, but none of us is alone," Mr Kagame said at the ceremony attended by several heads of state. "We Rwandans have granted ourselves a new beginning. "We exist in a state of permanent commemoration, every day, in all that we do ... Today, light radiates from this place." Earlier in the day, Mr Kagame and his wife laid wreaths and lit a flame at the mass burial ground of 250,000 victims at the Kigali Genocide Memorial Centre in the capital, Kigali. "Time can never erase the darkest hours in our history. It is our duty to remember." Songs, poems and plays about the rebirth of Rwanda after the genocide the new nation were later performed at the Kigali convention centre. Belgian prime minister Charles Michel said "the duty of remembrance must be a sacred requirement". Belgian peacekeepers were among those killed in Rwanda during the genocide. Ethiopia's prime minister expressed solidarity with Rwandans and said under Mr Kagame's leadership, seeds of unity and never again had been sowed. 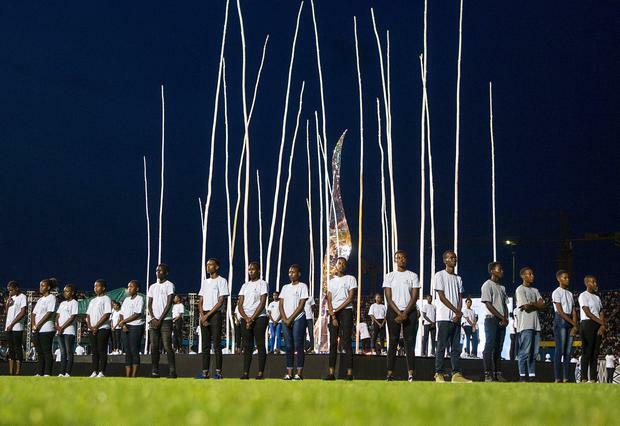 Then followed a procession through the capital to Kigali's National Stadium where are many as 30,000 are expected to participate in an evening candlelight ceremony. "Twenty-five years ago, Rwanda fell into a deep ditch due to bad leadership, today, we are a country of hope and a nation elevated," Agnes Mutamba, 25, a teacher who was born during the genocide said in Kigali. The mass killing of Rwanda's Tutsi minority was ignited on April 6 1994, when a plane carrying President Juvenal Habyarimana was shot down and crashed in Kigali, killing the leader who, like the majority of Rwandans, was an ethnic Hutu. Mr Kagame's government has previously accused Hutu-led government of 1994 of being responsible for shooting down the plane and has blamed the French government for turning a blind eye to the genocide. On Friday, French President Emmanuel Macron ordered a government study into the country's role in Rwanda before and during its 1994 genocide. Mr Macron ordered a commission of researchers and historians to investigate the "role and involvement of France" in Rwanda from 1990-1994. It is to make conclusions within two years. Mr Kagame has won praise for ending that violence and making advances in economic development and health care. Ethnic reconciliation is a cornerstone of the rule of Mr Kagame, Rwanda's de facto leader since the genocide ended in 1994 and the country's president since 2000. He is credited with bringing Rwanda stability, economic growth, and improved health and education. A quarter-century after the genocide, bodies of victims are still being found. Last year, authorities in Rwanda found discovered mass graves they said contain 5,400 bodies of genocide victims. 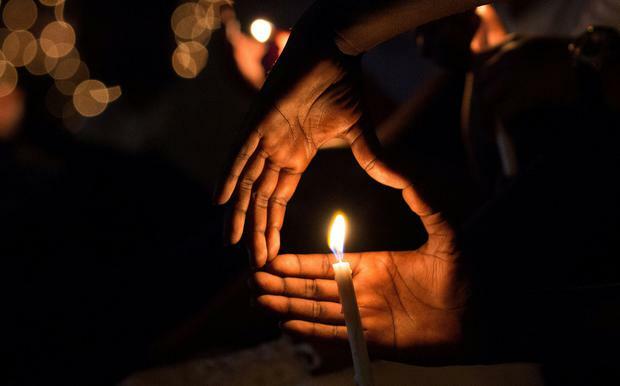 "Twenty-five years on, the victims and survivors should remain the centre of everyone's thoughts, but we should also take stock of progress and the need to ensure accountability for all those who directed these horrific acts," Human Rights Watch said.